Experience everything from world-famous temples to beaches, royal cities and emerald bays on this 19-night small escorted tour of Cambodia and Vietnam. This is the perfect trip for those looking to explore a slice of Southeast Asian culture and history. The adventure begins in Cambodia’s capital Phnom Penh and moves on to Angkor Archeological Park, before traversing the length of Vietnam, from steamy Ho Chi Minh City to the northern capital, Hanoi. Learn about Vietnam’s war history and pay your respects at Cambodia’s emotional Killing Fields. You’ll get the chance to travel on a traditional sleeper train and spend the night with locals in the Mekong Delta, as well as explore the former royal city of Hue and chill out in one of Vietnam’s top beach spots, Nha Trang (INT - TKKHC). 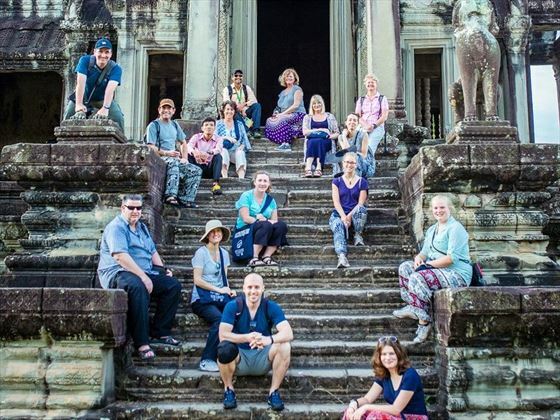 Temple hop around Angkor Archeological Park and watch the sunrise at the UNESCO Angkor Wat. Stay with locals for the night in the Mekong Delta. Explore Vietnam’s former Imperial Capital, Hue, and sail down the Perfume River. Travel like a local on an overnight sleeper train. 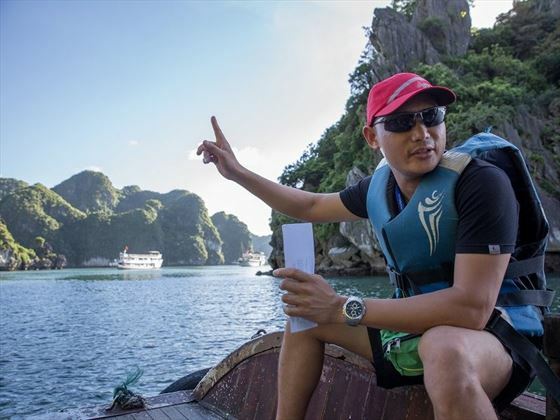 Cruise UNESCO-listed Halong Bay and spend the night on a junk boat. Experience Phnom Penh and confront Cambodian history at the Killing Fields. Snorkel and relax in Nha Trang, one of Vietnam’s top beach destinations. The tour starts with a transfer from Phnom Penh airport and a chance to rest or get a first taste of Phnom Penh before the 6pm welcome meeting. You’ll enjoy dinner at Friends, an NGO-run restaurant that helps train and educate local homeless and vulnerable young people. Sample a delicious fusion of Asian and Western tapas dishes. Today you’ll really get to grips with Phnom Penh on a full city tour. Wander the grounds of the Royal Palace, home to King Sihamoni, with its sacred Silver Pagoda. Cambodia bears the scars of Pol Pot’s genocidal Khmer Rouge regime, which was responsible for the estimated deaths of three million Cambodian people just over forty years ago. To learn about this history, you’ll be taken to visit the Tuol Sleng Prison Museum, a former school that was used as a prison for up to 20,000 people. The tour also includes a trip to Choeung Ek Killing Fields, where many of the prisoners from Tuol Sleng were taken and executed. The peaceful countryside setting is home to a memorial stupa for the victims, made of around 8,000 human skulls. These are important Cambodian experiences, but please notify your tour leader if you’d prefer not to take part. Alternative activities include visiting the National Museum, taking a cyclo tour or visiting Wat Phnom, a 15th century temple. 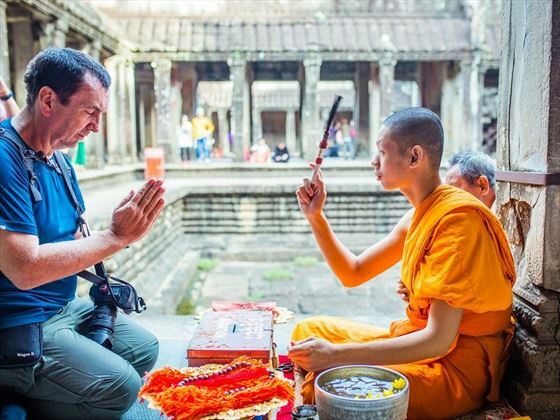 After breakfast, you’ll take a one-hour flight to Siem Reap, a lively city that’s famous as the jumping-off point for visiting Angkor Wat, the largest religious monument in the world. Spend the day exploring the city independently and take a trip to the old market, which is full of local fabrics, arts and crafts. Don’t miss the Cambodian street food and catch a shadow puppet show to round off your evening. Spend the whole day exploring the Angkor Archeological Park, a series of incredible temples that are recognised by UNESCO as a World Heritage Site. Angkor Wat is the star attraction and the largest and most complete temple, which stretches across 400 square kilometres and is full of 12th century sculptures. 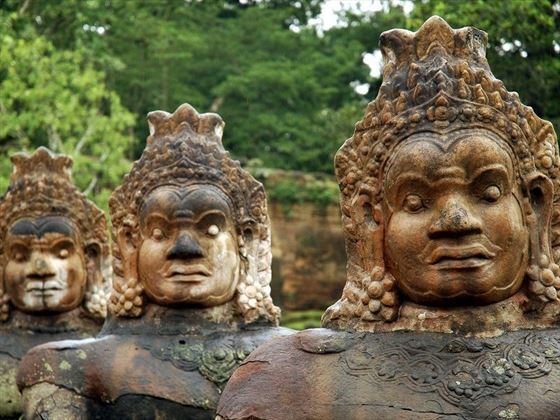 You’ll also visit Angkor Thom and Bayon Temple, which features 200 faces carved into stone. Enjoy lunch at Sala Bai Hotel School, which employs and trains young people from the local area. Spend the afternoon at Ta Prohm, a temple intertwined with the jungle and famously used as a setting for the film Tomb Raider. End the day by watching the sunset over the spectacular temple tops. Note that Sala Bai is closed on public and school holidays, in which case you’ll visit another restaurant. You can choose to get up early and watch the majestic sunrise over Angkor Wat. Next up is a visit to the Angkor Centre for Conservation of Biodiversity (ACCB), where you’ll see animals that were rescued from wildlife trafficking. The centre also runs a breeding program for endangered animals like gibbons and pangolins. From there, you head onward to Banteay Srei Temple and then choose to either relax at your hotel, or carry on exploring. If you continue temple hopping, you may visit quieter gems like Preah Khan, another crumbling jungle temple with a maze of corridors. Other optional activities include visiting Tonle Sap Lake and its floating villages, taking a trip to the Landmine Museum, enjoying a Khmer cooking class or indulging in a traditional massage. It’s time to say goodbye to Cambodia and fly to Ho Chi Minh City in southern Vietnam. You’ll fly unescorted and be picked up from the airport for a transfer to your hotel. Since this is a combination trip, your group leader and fellow travelers may change at this point, so there’s another welcome meeting in the evening followed by a group meal. To kick off the day, you’ll have breakfast at KOTO restaurant, which supports vulnerable youths by teaching them hospitality skills. Then you’ll travel three hours by bus to Cai Be, the gateway to the lush Mekong Delta, known as Vietnam’s Rice Bowl. Take a boat trip along the canals in the midst of rice paddies, sample tropical fruit and visit orchards. At sunset, you’ll head to a nearby guesthouse where you’ll dine on regional dishes and spend the evening with your local hosts. Accommodation consists of simple twin and double rooms with bedding and mosquito nets. Be aware that bathroom facilities may be shared and have no hot water; it’s all part of the experience. Take a dawn boat trip to a Mekong Delta market, to watch the locals trade and barter before returning to Ho Chi Minh City, Vietnam’s largest metropolis. Experience a blend of history and modernity on a walking tour, where you’ll visit the powerful War Remnants Museum which tells the story of Vietnam’s turbulent war history. As an optional extra, you can tour the Reunification Palace, which was taken over by Ho Chi Minh’s communist army in 1975 and represents a key moment in the war. Today, you’ll tour the infamous Cu Chi Tunnels, which lie a few hours outside of HCMC. Learn about how the Viet Cong used the 120-kilometre network of underground tunnels, as well as booby traps, against American soldiers and get an insight into what life was like during the war. After heading back to Ho Chi Minh City, you’ll take the overnight train alongside locals to Nha Trang, one of Vietnam’s best beach destinations. Note that berths typically sleep four to six people, so you may be sharing with others not in your party. Bedding is provided and there’s usually a dining carriage, but bring your own snacks. Arrive and head straight to your Nha Trang hotel, then you have the rest of the day to yourself. Head down to the sandy beach to soak up some sun, swim in clear turquoise waters and have a meal in one of the seaside restaurants on the promenade. If you’re in the mood for sightseeing, take a tour to some nearby mud baths or Po Nagar Cham Towers in the centre of the city. Get a dose of sun, sea and sand with a boat trip to some of Nha Trang’s nearby islands. You’ll make a stop at a traditional Vietnamese fishing village, as well as idyllic Hon Mun Island. There’ll be plenty of time for swimming and snorkelling to discover the area’s diverse underwater treasures. You can also relax on board and dine on a seafood buffet lunch. Fly to Danang and travel by minibus to the picturesque town of Hoi An. You’ll have the rest of the day to wander the historic port city, which is UNESCO-listed for its well-preserved mix of European, Vietnamese and Chinese architecture dating back to the 15th century. Shop for hand-made outfits at one of Hoi An’s famous silk tailors, who provide an express service and can ship clothes straight to your home country. Dine by the riverside and take in the pretty, lantern and tree-lined streets. Today you’ll delve into the history of Hoi An with a guided walking tour of the Old Town. 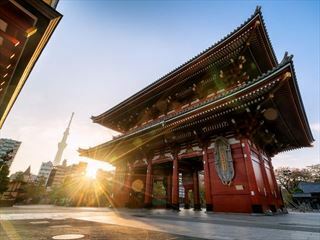 Discover the area’s history as a major trading port in the 17th century onwards and visit merchant houses, ornate Japanese bridges and Chinese temples. During the afternoon, you’re free to relax or take optional bike tours through the nearby countryside to beaches, cruise along the Thu Bon River or take a street food tour by night. 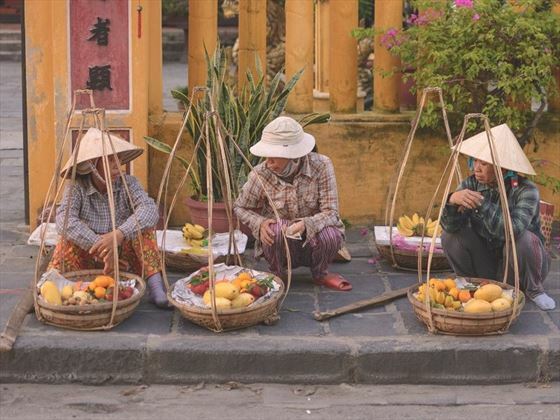 Make the most of your final day in Hoi An by rising early and heading out to the local morning market, where locals buy and sell fish and produce. The day is yours to relax or enjoy an additional activity. Options include taking a Vietnamese cooking class, where you’ll shop for local ingredients to create famous dishes like Pho. You can also head to the beach, cycle around town or take a day trip into the countryside. Nearby My Son is a UNESCO site filled with ruins of the Cham civilisation and set in a beautiful valley with views of Cat’s Tooth Mountain. Travel by bus up the coast to Hue along one of the most scenic roads in the country, Hai Van Pass. You’ll make a stop at Lang Co before arriving in Hue, the former capital of Vietnam and seat of the powerful Nguyen Dynasty until 1945. Spend the rest of the day touring this UNESCO site, which is packed with history. You’ll be taken to the Imperial City and Forbidden Purple City, a walled area surrounded by a moat. This 19th century complex was home to ancient emperors and is filled with gardens, palaces and shrines. Start the day with a bowl of Bon Bo Hue, traditional beef noodle soup, before you set sail for a cruise along the Perfume River. Along the way you’ll stop to explore a Buddhist monastery that dates back to 1601 and features the 21-metre tall Thien Mu Pagoda. Have lunch at a Buddhist monastery or nunnery, where you can taste local dishes. Afterwards, you’ll visit the royal tomb of Emperor Tu Duc, which lies in gardens with a lake and frangipani trees. Note that during festival season, boats may not be available and you’ll visit the attractions by car instead. Fly to Hanoi, Vietnam’s charming capital. 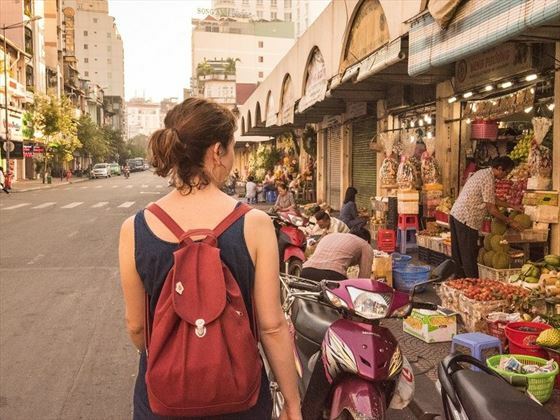 An afternoon walking tour will give you a taste of the city’s 1,000-year history, which is visible in its traditional Vietnamese shops and crumbling colonial buildings. Highlights include the historic Old Quarter, peaceful Hoan Kiem Lake and the Chinese-inspired Temple of Literature. You’ll get to see the ornate One Pillar Pagoda and the humble wooden stilt house where Ho Chi Minh, Vietnam’s famous revolutionary leader, once lived. In the afternoon, you can relax and explore independently with optional extras such as a visit to the Vietnam Fine Arts Museum. Make the four-hour bus trip to Vietnam’s most-visited destination, Halong Bay, where you’ll board a traditional junk boat for an overnight cruise. Take in views of the UNESCO-listed bay and its unique limestone karst formations as you sail across the calm waters and past floating villages. Stop at magical caves, kayak around the bay and in the summer, you’ll have a chance to go swimming. 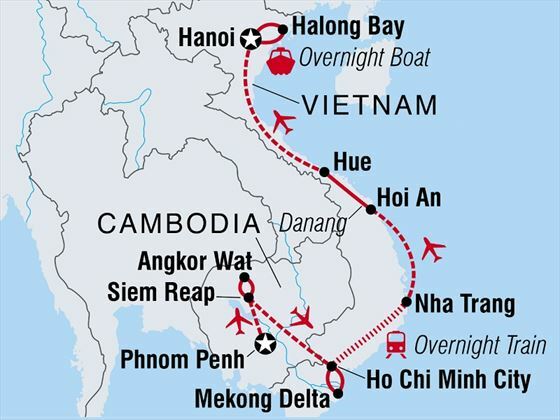 We recommend packing an overnight bag for the cruise and storing the rest of your luggage in Hanoi. You’ll be staying in twin cabins with air con and private bathrooms. There’s a dining room where you’ll be served meals, including a seafood buffet lunch. Due to restrictions on the amount of boats in the bay, you may be on a larger vessel with another group. Drive back to Hanoi via a stop at the Dong Trieu Factory, which produces ceramic art. Back in the city you’ll be taken to a water puppet show, which is a traditional art form that originated in the Red River Delta region. Spend the rest of your time sightseeing in Hanoi. Popular museums include the Hoa Lo Prison, where American soldiers were famously held during the war, and the Museum of Ethnology. Depart your accommodation at any time. There are no activities planned for the final day, but if you have time, you can do some shopping in the Old Quarter, sample some local street food or take a bicycle tour of the city. Accommodation: 16 nights hotel accommodation, one night in a guesthouse, one overnight sleeper train and one overnight boat trip. Transport: boat, sleeper train, flights, bus, private car, taxi. Food: 19 breakfasts, six lunches and six dinners. Activities: Tuol Sleng Prison Museum, Choeung Ek Killing Fields and the Royal Palace and Silver Pagoda in Phnom Penh. 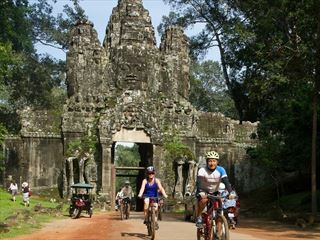 Three-day Angkor Wat Pass, guided temple tour and Angkor Centre for Conservation and Biodiversity in Siem Reap. Ho Chi Minh City War Remnants Museum and Cu Chi Tunnels and Mekong Delta market. Hon Mun Island boat trip and snorkelling in Nha Trang and Hoi An Ancient Town Entrance. Hue Imperial Citadel, Perfume River Cruise, Thien Mu Pagoda and Royal Tomb. Hanoi Temple of Literature, Old Quarter tour, One Pillar Pagoda, Ho Chi Minh stilt house and water puppet performance. Halong Bay overnight cruise. The minimum age for this group tour is 15 years of age. Amazing savings Book your holiday by 3 May 19 and receive up to $710 discount. Travel before 15 Dec 19.